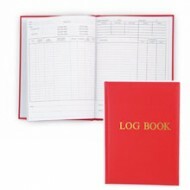 This logbook has been designed for the coastal cruising yachtsman, with headings for time, log reading, wind direction, barometric pressure, local tide times and tidal flows. The book is stitched and bound with a red vinyl cover and gold motifs. Dimensions: 240mm x 178mm.. The Channel Range of instruments is made of solid laquered brass with an opening latch and bevelled glass. The Tide Clock features a quartz movement and an additional hand which records lunar time over a 24 hour 50 minute period and so indicates successive high and low tides. DIMENSIONS Back Fl.. The Channel Range of instruments is made of solid unlaquered brass with an opening latch and bevelled glass. The clock has a quartz movement. 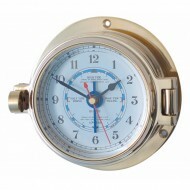 DIMENSIONS Back Flange Diameter: 117mm Face and Dial Diameter: 79mm Depth: 52mm Other Models in the Brass Channel Range. 18029 Tide Clock 18030 Clock 180.. The Channel Range of instruments is made of solid laquered brass with an opening latch and bevelled glass. 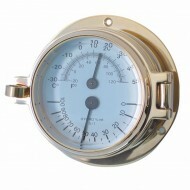 The thermometer hygrometer can tell you the temperature and humidity using two separate devices in the same case. DIMENSIONS Back Flange Diameter: 117mm Face and Dial Diameter: 79mm Depth: .. The Channel Range of instruments is made of solid laquered brass with an opening latch and bevelled glass. 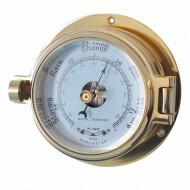 The barometer is a sealed unit with adjustment mechanism. 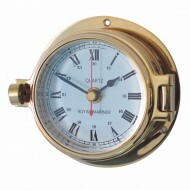 DIMENSIONS Back Flange Diameter: 117mm Face and Dial Diameter: 79mm Depth: 52mm Other Models in the Brass Channel Range. 18029 Ti.. The Channel Range of instruments is made of solid laquered brass with an opening latch and bevelled glass. 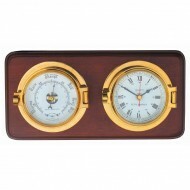 The clock has a quartz movement and the barometer is a sealed unit with adjustment mechanism. These two instruments are mounted on a wooden board with oak stain. DIMENSIONS Instrument Back F..